'MLM' The American Dream Made Nightmare: 'Fortune Hi-Tech Marketing' is a pernicious lie, and Paul Orberson and Tom Mills were its authors..
'Fortune Hi-Tech Marketing' is a pernicious lie, and Paul Orberson and Tom Mills were its authors..
Sanctimonious 'MLM income opportunity' racketeer, Paul Orberson. Paul Orberson's sanctimonious side-kick, Tom Mills. In the adult world of quantifiable reality, the US federal authorities have called a halt to the version of the pernicious 'MLM' game of make-believe known as 'FHTM,' and an estimated 160 thousands deluded players are no longer allowed to act as de facto slaves for its handful of instigators. However, the remnants of the same mind-bending criminal enterprise is apparently still being allowed to operate in Canada, and elsewhere (including the UK), right under the noses of regulators and prosecutors. Laughably, the person described as current 'Chief Analytics Officer' and former 'Chief Financial Officer' of 'Fortune Hi-Tech Marketing Inc. (FHTM)' is none other than Simon Davies, the former 'Internal Audit Director' of 'Herbalife Ltd. (HLF),' 1994-2006. Classically, the quantifiable evidence proves beyond all reasonable doubt that the so-called 'FHTM MLM income opportunity' has been effectively a means of committing financial suicide, but maliciously designed to silence its victims by indoctrinating them into the guilt-producing closed-logic belief that only completely-positive, highly-motivated, hard-working persons who defer to the authority of their completely-positive, highly-motivated, hard-working leadership and who believe totally that they will achieve success: achieve success and that consequently, all persons who fail to achieve success in FHTM are a bunch of negative, worthless losers who only have themselves to blame. Prior to the case coming to trial, the Lexington HQ and warehouse of 'FHTM' have been raided and their contents seized by a receiver, Robb Evans (appointed by the U.S. District Court for the Northern District of Illinois). The counterfeit company's assets have been frozen and most 'FHTM' employees no longer have a job. In reality, the corporate-front known as 'Fortune Hi-Tech Marketing' forms part an overall pattern of ongoing, major racketeering activity (as defined by the US Federal Racketeer Influenced and Corrupt Organizations Act, 1970). Sadly, US prosecutors don't yet seem to have grasped that 'FHTM' is only a relatively small criminal enterprise in comparison with 'Amway', 'Herbalife', 'Nu Skin', 'Forever Living Products', etc., from which its grotesque modus operandi was copied. In simple terms, since the instigation of the original 'MLM' racket, in the 1940s, the only real money flowing into all subsequent so-called 'MLM income opportunities,' has come from the victims of inter-related-frauds. Fraud 1. is what is popularly-called a pyramid scheme, but which I prefer to describe, in more-accurate terms, as a dissimulated closed-market swindle - this type of crime is based on planting the self-perpetuating, pernicious belief that never-ending recruitment + never-ending payments by the recruits = never-ending profits for the recruits. The bosses of numerous 'MLM' gangs have not only lied to, but they have also withheld key-information from their victims and from regulators about the real source of their revenue. In this way, they have laundered many billions of dollars of illegal investment payments (made on the false expectation of future reward) into their dissimulated closed-market swindles, by arbitrarily and falsely defining these payments as 'lawful sales' based on value and demand. Fraud 2. is a form of advance fee fraud in which many billions of dollars of effectively-valueless materials have been peddled to the constantly-churning victims of fraud 1. on the pretext that these are 'business-building/training/motivation tools' which 'contain valuable secrets vital to achieving success.' In reality, it is through these fraudulent materials (usually comprising publications, recordings, tickets to meetings) that a never-ending chain of victims of fraud 1. have been indoctrinated to believe that failure to make money in 'MLM' must have been entirely their own fault. You hit the nail on the head. Two of FHTM's top reps have left in the past 3 weeks since the FTC crisis found it way into America's media. Ruel Morton has taken his huge team to Shaklee and #2 guy Todd Rowland has taken his team to Herbalife. 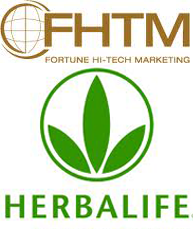 The CFO of FHTM is an ex-Herbalife CFO. How many of the 160K reps have left? Will anyone be left come the preliminary injunction hearing in the USA set for March 13th? At this rate Paul wont have a company anyway. Ruel Morton was the problem. When he and his dishonest reps came to the company in Nov 2004, it was the start of the death spiral. THAT'S when FHTM began to focus on recruiting rather than customers. Ruel and his organization bankrupted Excel Communications before they left there too. Anonymous - Why is it that persons such as yourself always recite the same reality-inverting script, in which you seek to paint so-called 'MLM income opportunities' as perfectly lawful businesses (based on retail sales), and certain 'MLM' shills as being wicked crooks who have infiltrated these innocent enterprises to peddle endless chain recruitment? The fact that all so-called 'MLM income opportunities' have been hiding greedy little bums like Ruel Moton, is conclusive proof that what we are dealing here is no innocent enterprise, but a form of major racketeering activity which has been maliciously set up in such a way as to prevent, and/or divert, investigation and isolate its beneficiaries from liability. Indeed, your tediously-familiar, scripted defence of 'MLM' racketeering, is itself part of an overall pattern, as well as an insult to my readers. Has anyone taken a look at the latest findings that Robb Evans and Associates has published on FHTM's website? Incredible and confirms that the focus was on recruiting. Also shows the high drop out rate and the high % of people that didn't make money. My memoir SKAPEGOAT - a whistle blower's memoir - The FHTM Blame Game Story is now available for the Kindle via Amazon as well as print via Lulu. It will soon be available on the iPad. This compelling, true and personal, story is about a successful semi-retired 30+ year entrepreneur that turned whistle-blower after getting involved with an illegal Ponzi style MLM called Fortune Hi-Tech Marketing (FHTM) in 2009. Top FHTM leaders and its founder Paul Orberson tried to destroy his life after he developed a FREE Facebook style tool-set for the industry. Subsequent to FHTM receiving their 2nd cease and desist from Montana, he filed a complaint with the Kentucky BBB explaining their fraudulent ways, in an effort to get reimbursement for unwanted inventory. Shortly thereafter they make him the global scapegoat for everything bad happening to FHTM. The memoir is finally available. All of the truth telling about the internal workings of FHTM as a corrupt and Ponzi type MLM is available. Whistle-blower Joseph Isaacs, who was made famous by exposing the Fortune Hi-Tech Marketing (FHTM) pyramid scheme and fraud back in 2010 has just released his memoir called, “Skapegoat – the FHTM Blame Game Story” via Amazon at http://www.amazon.com/dp/B00C43JKQG or in paperback via https://www.createspace.com/4227088 This compelling, true and personal, story is about a successful semi-retired 30+ year entrepreneur that turned whistle-blower after getting involved with an illegal Ponzi style MLM called Fortune Hi-Tech Marketing (FHTM) in 2009. Top FHTM leaders and its founder Paul Orberson tried to destroy his life after he developed a FREE Facebook style tool-set for the industry. Subsequent to FHTM receiving their 2nd cease and desist from Montana, he filed a complaint with the Kentucky BBB explaining their fraudulent ways, in an effort to get reimbursement for unwanted inventory. Shortly thereafter they make him the global scapegoat for everything bad happening to FHTM. Mr. Isaacs was hit with a frivolous lawsuit claiming trademark violation for marks they never owned. The “fortune mark” is owned by Time, Inc. and FHTM was under an order to stop using it themselves. This was a foolish attempt to gag him and stifle his "Freedom of Speech" rights to prevent FHTM from being further branded as an "Illegal Pyramid Scheme". The stress of the harassing litigation caused multiple life-threatening heart attacks. Mr. Isaacs almost died in 2011 from the heart issues caused by FHTM. This story will keep you mesmerized by the deceit, sexual harassment, lies, judicial manipulation, influence peddling and the drama that unfolds over the next couple of years. It looks like Paul Orberson and Tom Mills (the leaders of the now defunct FHTM) have been banned from MLM and any other business by the FTC as part of a stipulated and agreed preliminary injunction. My ear was bent and twisted to fork over about $400.00 to get involved with this scheme. I saw through it and never signed on. Unfortunately it was a really close friend of mine that was pressuring me as she really believed in it. I tried to explain to her what it was all about, but she insisted that it was the greatest thing since sliced bread. Thanks FHTM for ruining a friendship and stealing their money while you were at it. I'm very sorry to hear that John. From my own experience with members of my own family, I know that, often, the more you try to reason with de facto 'MLM' slaves, the more you risk driving them further into their group-delusion. Cultic racketeers, like those who instigated 'FHTM,' employ coordinated devious techniques of social, psychological and physical persuasion designed to shut down the critical, and evaluative, faculties of their subjects (without their fully-informed consent) whilst giving them the illusion that they are making free choices. The most deluded cult adherents live in a comic-book world where reality has been inverted. They are always convinced that no one is controlling them and that their group cannot possibly be a cult instigated by manipulative criminals. For a long time, I have been saying that the techniques employed by cults, constitute a form of damaging psychological experiment forbidden by the Nuremberg Code. Please feel free to send me your contact details in another comment (these will not be posted). Here in Canada Veema and FHTM teams have moved over to Zija. Linda Proctor (VEmma) and Melanie and Greg Greenough (FHTM) are moulded together in Toronto and Vancouver. I believe Orberson wife is also with Zija. Zija doesn't seeem to be on the FTC's radar though. Thanks Unknown - I believe the 'Zija' racket is Utah-based. 'Zija's' propaganda has fallen foul of all the conditions which the FTC has recently imposed on the 'Herbalife' racketeers and which senior FTC officials implied would be imposed on all other so-called 'MLM direct selling' companies. It remains to be seen what the FTC will actually do to tackle the wider 'MLM' phenomenon, or rather what it will be allowed to do under the administration of 'MLM' pitchman, Donald Trump. Indian 'Herbalife' shill quotes Mao! Today's 'Direct Selling Association,' is a lie.